The six-mile Iowa River Corridor (IRC) Trail is Iowa City’s longest and most heavily used trail. Public parking for trail access is available at Napoleon Park, City Park, Ned Ashton Park and Crandic Park. The IRC Trail provides access to several parks, the University of Iowa campus, downtown Iowa City, the Iowa River, and it connects to many intersecting streets and sidewalks, and on its north end provides access to Coralville. 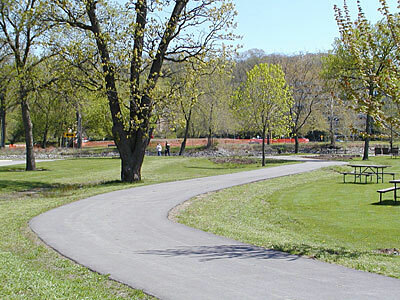 The Willow Creek Trail on the west side of Iowa City is approximately two miles long, and connects to Willow Creek Park, Kiwanis Park, Walden Square commercial area, West High School, and surrounding neighborhoods. Public parking is available at Kiwanis Park and Willow Creek Park for trail access. Two recently constructed links in the trail network include the IRP Dam pedestrian bridge, linking Coralville to the Peninsula Park and the Iowa River Corridor (IRC) Trail; and the trail under Interstate-80, linking Waterworks Prairie Park to the rest of the IRC Trail System. These projects show how trails are linking our communities closer together. Some trail projects planned in the near future include a trail along Ralston Creek between Creekside Park and Court Hill Park in East Iowa City, and a pedestrian bridge over the Iowa River adjacent to the Dubuque Street/Iowa River bridge. The trails depicted on the map are hard surfaced, either concrete or asphalt, and all non-motorized use is permitted, including walking, jogging, in-line skating, skateboarding, scooting, etc. Please observe trail etiquette when using the trails, and respect other trail users!